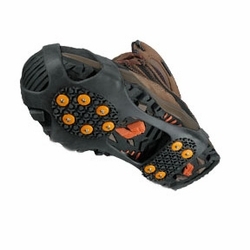 DryGuy GripOns™ Snow & Ice Cleats significantly improve traction on ice and snow. In independent testing, GripOns were the overall champ when considering ease of use and traction in various conditions. GripOn, which provide excellent fit and stability, are ideal for the more active outdoor enthusiast. High quality user-replaceable steel spikes under the ball and heel of your foot provide excellent slip and fall protection on slick surfaces. Grip Ons™ stretch to fit easily over any type of shoe or boot (for high volume boots use 1 size up). Flexible and compact for easy carrying and storage. BOOTS NOT INCLUDED. NOT DESIGNED FOR TECHNICAL CLIMBING. *Note: If you are in between sizes, or if you are using GripOns on oversized winter footwear or boots, we recommend that you go up one size.